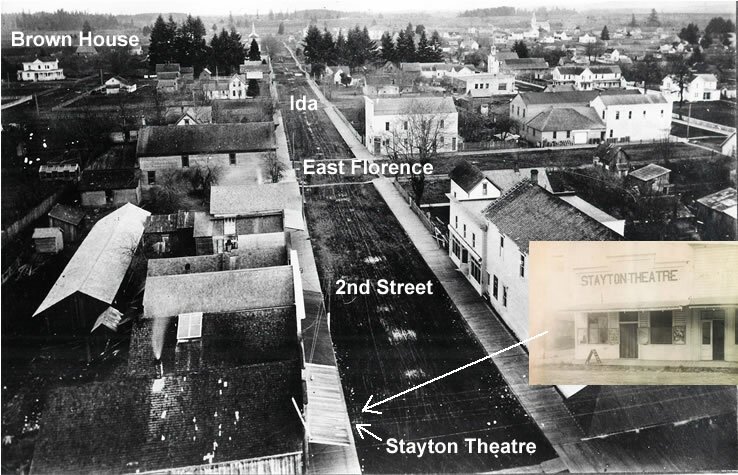 Above is a photo of the Stayton Theatre around 1913, which was located off of 2nd and E. Water St. near the automotive area of downtown Stayton of today. 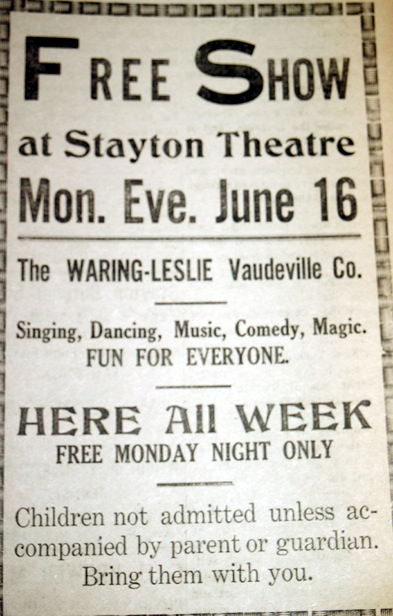 The photo's below are from the 1913 Stayton Mail Newspaper. 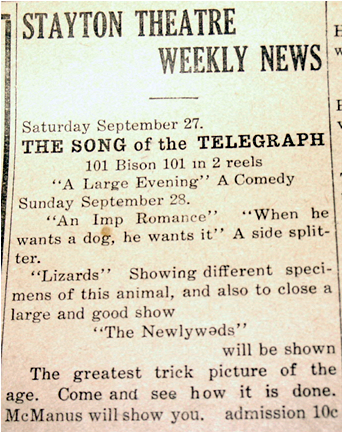 In addition to showing motion pictures, live entertainment was offered almost weekly. You could come to the Stayton Theatre and enjoy singers, dancers, musicians and all sorts of theatrical entertainment from all over the United States. 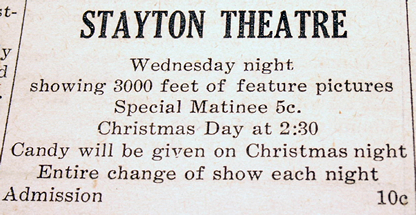 The Stayton Theatre eventually moved to the Oddfellow building and was renamed Star Theatre. That theatre closed down just after the Star Theater opened where the Police Station is now located. The photo on the left is from Opening Day Ceremonies at the New Star Theater in 1914, where the Oddfellow is located. Click image for larger view. The days of "The Perils of Pauline" and other oldies. 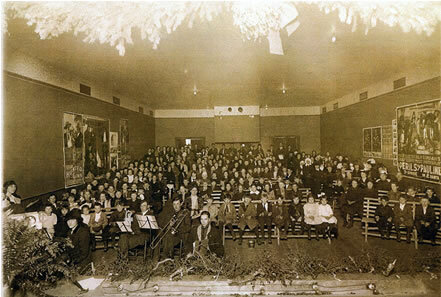 Boughs of evergreens, barely visible above, show the festive occasion as a small band and pianist, lower left, accompany screen images. Genevieve Lawrence is one of the local residents who remember the old movie days - she accompanied the moods of screen stars on her old upright, earning about $1 an evening in the early 1920's. She never took a lesson and played completely by ear such tunes as the Maple Leaf Rag and the Burning of Rome. For 25 cents you could watch Rudolph Valentino or Abbot and Costello. Then between 1919 and 1922, the new Star Theatre opened where the current Police station is today. Frank Lesley built the theatre and Ed Keech ran the movie house then; and in 1937 Lawrence and Mae Spraker bought the Star from George and Edwin Keech. Spraker took on a partner in 1946, Marcel VanDreische. 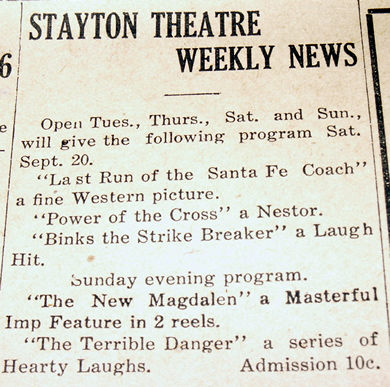 In 1949, the New Star Cinema of today was opened and Spraker concentrated on the Stayton Mail Newspaper while Marcel took full ownership of the theatre. 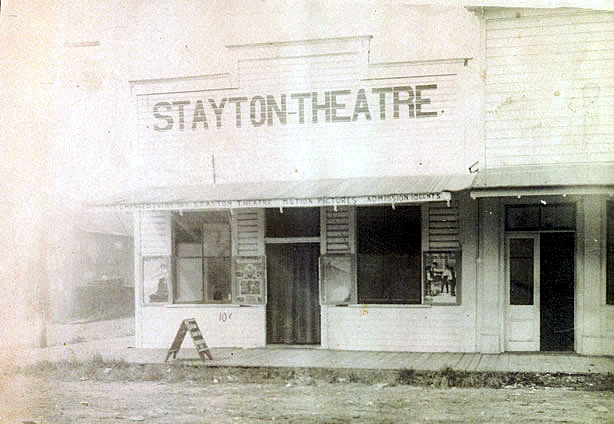 Frank Lesley, owner of the Stayton Hotel, built the Stayton Theatre in 1912 and leased it for a year to Ted Rizzo at his first location in the old store front on 2nd street. 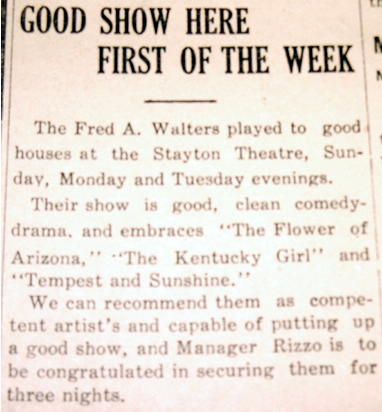 At the end of the lease, Rizzo moved his operation into part of the Oddfellow building and a Mill City man named Wadsworth took over the Lesley theatre for six months. It was he who named it the Star. At the end of six months Wadsworth pulled out and Lesley's 18 year old son, Oliver, managed the Star for about two years after which it was leased to half a dozen different people and finally sold in 1919 to Harry Humphries who, in turn, sold to George Keech in 1926. Keech installed the first sound projectors and he and his son, Ed, operated the theatre until selling it to Lawrence Spraker in 1937. Thomas Ince (1882-1924), known for inventing the studio system, was the first studio executive who embraced the western in the teen years. He arrived in California in 1911, where he produced detailed scripts with new situations and characters for a vast number of classic westerns. 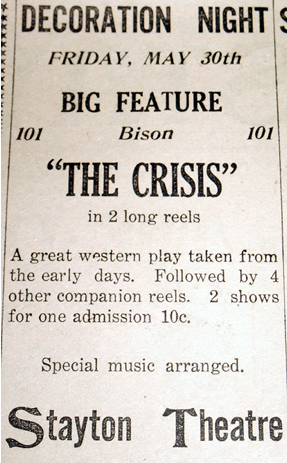 In 1912, his Bison Company production studios (known as Inceville) purchased the Miller Brothers 101 Ranch and the Wild West Show to use their props and performers for his assembly-line, mass-produced films. 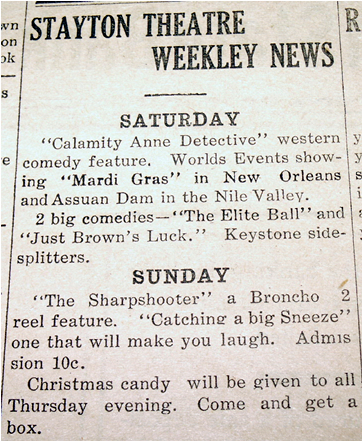 By 1917, little-known John Ford was directing westerns in California for Ince. Universal Pictures, (or Universal Film Manufacturing Co), founded by Carl Laemmle in 1912; formed from a merger of Laemmle's own Independent Motion Picture Company (founded in 1909) with Bison 101, the U. S. production facilities of French studio Éclair, Nestor Film Co., and several other film companies; its first successes were W.C. Fields and Abbott and Costello comedies, the Flash Gordon serial, and Woody Woodpecker cartoons. One of the earliest trail-blazing industry's innovators was producer/director Thomas Harper Ince, whose major claims to fame were the making of crude westerns and the development of the "factory-studio system" to mass produce films. After a short stint at Biograph as an actor and director, he joined Carl Laemmle's Independent Moving Picture (IMP) Company, and moved west in 1911. 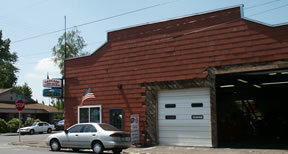 His New York Motion Picture Co. and the Selig Polyscope Film Company of Chicago set up studios near Los Angeles in Edendale [present-day Echo Park], initiating the establishment of West Coast studio production. The studio reinvigorated the Western film genre. Ince's authentic-looking pictures were due to the fact that he hired real-life cowboys and Indians from the 101 Ranch as extras in his films. In 1914, he was responsible for launching the career of William S. Hart, an actor who starred in dozens of westerns until 1925. Filming ceased at the Inceville property around 1922 and the buildings burned to the ground in 1924. Ince mysteriously died one night in 1924, aboard William Randolph Hearst's yacht in the harbor of San Pedro (recreated in Peter Bogdanovich's The Cat's Meow (2002), speculating that he was shot by the host). Also, Orson Welles' Citizen Kane (1941) was based on William Randolph Hearst. Both movies a must see!